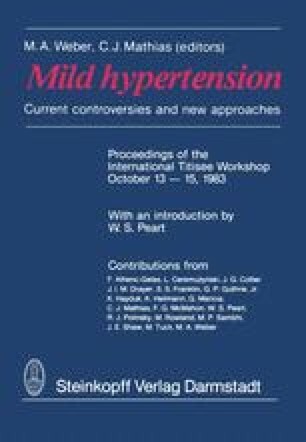 The aim of treatment of mild hypertension is to lower the incidence of cardiovascular events by reduction of blood pressure. This aim can be achieved (Australian Therapeutic Trial in Mild Hypertension 1980; HDFP Study 1979 a, b, 1982 a, b). Nevertheless the possible side-effects of antihypertensive treatment must be considered. The quality of life of the patients is important especially since mild hypertension on its own is a relatively weak risk factor for the individual patient despite its high incidence in the community.